He's confident his agenda will bring Canadians to a brighter future. Prime Minister Justin Trudeau holds a press conference in Guangzhou, China on Dec. 7, 2017. OTTAWA — Justin Trudeau sees dark clouds on the political horizon: severe weather and income inequality begetting forced migration and a growing strain to feed the dispossessed, as well as the ever-present threats of terrorism and nuclear annihilation. But halfway through his mandate, the prime minister remains steadfastly confident that the agenda that won him power in 2015 — his "progressive approach" to global affairs, income disparity, globalization angst and populism — will be enough to carry Canadians to a brighter future. Politicians, says Trudeau, have two options. They can exploit that public angst for political gain, or do what he says his government has done: give tangible benefits to working people, while taxing the wealthy and making them remember the people who work for them. "That's the choice to be made," Trudeau said this week in an interview with The Canadian Press. "When people are anxious, are you amplifying that anxiety or are you allaying that anxiety with reasonable policy choices that are showing there is a reason for confidence in one's kids future. That's very much the latter path we chose to take in the 2015 election and I continue to choose." Canada, Trudeau said, is "bucking the trend in terms of globalization as a source of anxiety for citizens" by being "absolutely unequivocal" that global trade has to benefit everyone, not just the rich and powerful. And while he's honed his wording, sharpened his digs at the opposition and beefed up his economic arguments since the 2015 campaign, he said the policies he laid out during that marathon election remain relevant and active, even as he braces for the stormy ride he knows is coming from his opponents at home. Prime minister-elect Justin Trudeau shakes hands as he leaves following his victory speech at Liberal party headquarters in Montreal on Oct. 19, 2015 after winning the 42nd Canadian general election. Case in point: Trudeau is girding for more questions about his controversial vacation on the billionaire Aga Khan's private island, an adventure that earned him a rebuke from the ethics commissioner — a first for a Canadian prime minister. "I am expecting there might be a few more questions once Parliament returns on this ... exact issue," he said. 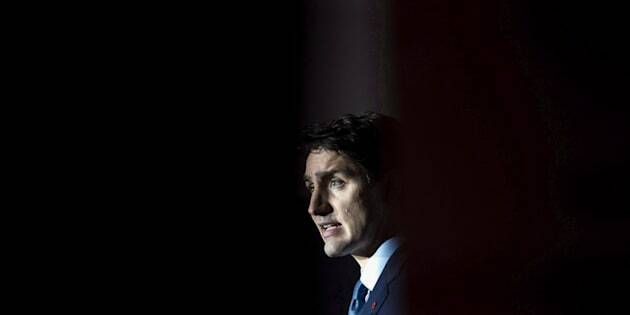 The controversy has given the opposition a powerful counterpoint to the preferred Liberal narrative, painting Trudeau as an elite child of privilege, divorced from the reality of the middle class he purports to champion. Not so, the prime minister insists, saying he's not above telling the rich and powerful they need to do better by the working people on whose backs they built their fortunes. It's a message he says he first delivered in Germany to a ritzy gathering of European business elite in Hamburg last winter. And he says that's why he ad-libbed an ominous, dark ending to a speech to a tony Fortune 500 audience in China last month. Trudeau said he took the measure of the room and decided it needed a special message. "You need to know that if you want to continue to succeed and want to continue to see a global environment that will allow you to succeed in business, you have to do a better job of thinking of the impact on ordinary people and families," he said. Next week, Trudeau is taking that message to Davos, Switzerland, where he will attend the World Economic Forum. A year ago, Trudeau skipped the annual gathering of political and economic elite as fallout from his Aga Khan trip discouraged him from wanting to publicly rub elbows with even more rich business people and celebrities. The trip, he said this week, will give him one more opportunity to trumpet his progressive approach. "We have the strongest economic growth of the G7. We have the lowest unemployment rate in Canada since before the Montreal Olympics [in 1976]. So, we have a concrete story to tell." Trudeau's message will be heard by one key guest — U.S. President Donald Trump, whose anti-trade policies don't dovetail with those of the prime minister. Trudeau continues to insist that it's not his job to preach to Trump, as other leaders such as French President Emmanuel Macron have done. He reiterates that he must find common ground with Trump on creating jobs and achieving a successful outcome to the North American Free Trade Agreement renegotiation. U.S. President Donald Trump listens to Prime Minister Justin Trudeau as they walk towards the Oval Office of the White House in Washington, D.C., on Oct. 11, 2017. "We know that he is committed to improving the plight of American workers who may feel that for many years there has been less benefit for them in globalization, in international trade, which is no different from what I said in the 2015 election." But Trudeau is also cognizant that the outside threats to his message are omnipresent, including by those who seek to use violence to instill fear and terror about an open, tolerant world and the ongoing nuclear crisis on the Korean peninsula. He also says climate change can unleash security threats that can touch Canada as well — a topic that's been thoroughly explored in military doctrine published by the Pentagon and Britain's military over the past decade. "On climate change the greatest threat facing Canada is continued behaviour as usual," he said, adding it is imperative for Canada to reduce pollution and develop new sources of clean energy. "Or else we know the world is going to be rapidly more and more extreme weather events that are going to cause displacement of millions upon millions of people around the world, and put an undue strain on our capacity to support all the mouths that there are to feed."